We know nothing divides opinion quite like reporting sales numbers. Some people absolutely love coming to grips with statistics while others dread wrestling with numbers and figures. Whether you're a sales manager compiling reports or a salesperson submitting the information that will form the basis of reports, a clunky, laborious system is the last thing you need. You want the right information quickly and easily. We get this. That’s why the team here at Pipedrive has been working around the clock to improve our reporting systems. We've automated some sections, expanded others and generally retooled the way the whole system works. We know simply seeing the results is not enough; you need to see the reasons behind the results and the actions you can take to control them. You need deep visibility into your pipeline, into what makes it work and what issues need to be fixed. That's why our new reporting system lets you actively manage the sales process, rather than retroactively trying to fix what went wrong. But enough talk, let's get right down to the nitty-gritty. 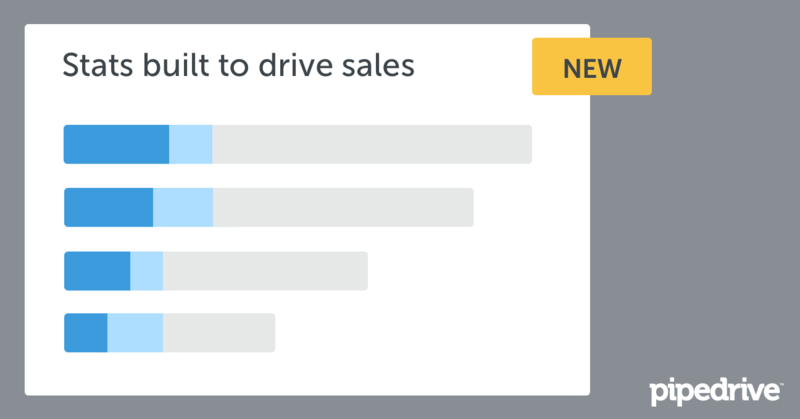 We now show sales results in a more comprehensive and flexible way. You can easily customize the period you'd like to view, drill down to individual members of your team and look at the monetary value or volume of deals. 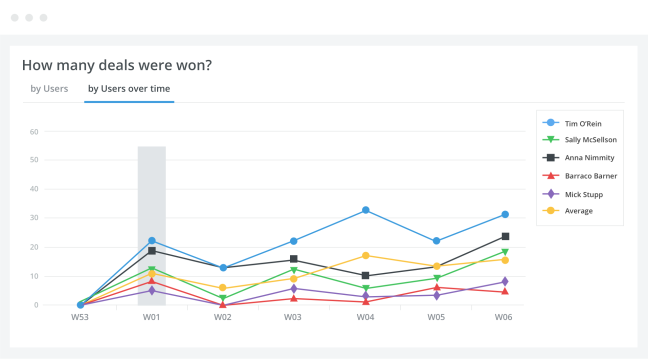 The Won Deals feature allows you to see which members of your team drive the most sales, who needs a bit of guidance and coaching and what actions you need to take to steer the good ship Sales Success in the right direction. Of course not all deals are won, and we often learn as much from failure as we do from success. 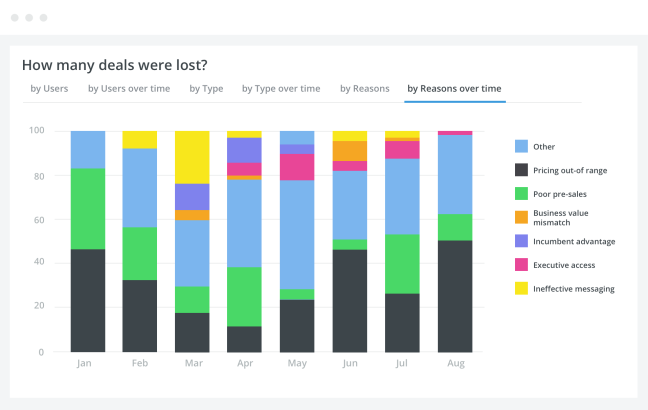 With Deals Lost you can drill down by individual and compare vs. selected previous periods to accurately measure and see results by stage, giving you a clear view of where you need to make changes. You'll recognize trends early and be able to spot when a competitor starts invading your territory and eating your lunch. Read more on that here. It stands to reason that simply looking at your results is not enough, which is why we give you visibility into the dynamics of actions that drive the results. Sales actions completed and new deals added are often the most important components that directly influence sales. To actively manage your sales process you need visibility into every aspect of your pipeline. You can look at both the total number and monetary value of new deals started, see which team member started them, and how this compares to previous periods. Example: If you know for your business every sales rep needs to add 10 new opportunities a week, then you're able to identify early on if someone is about to fall behind. 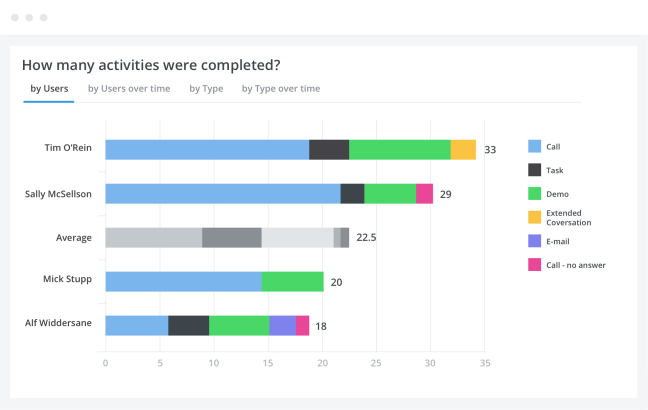 Or if a team member's “new activities planned” has dropped below previous periods, you can investigate whether this indicated reduced conversion or follow-up activities not being scheduled. We know any team worth its salt will look at these stats as a matter of course. For the true sales junkies and stats addicts, we now enable pipeline conversion analysis. See stage to stage conversion. Clearly see where the pipeline flow is easy and natural and where you may have a roadblock. Example: You see that salesperson No. 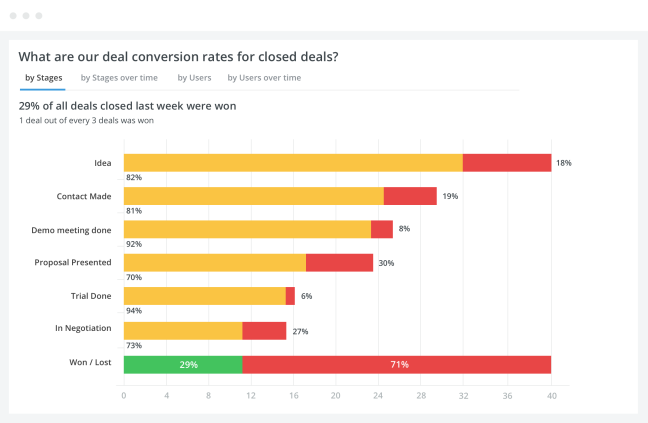 1's conversion rate from “Offer sent” to “Verbal yes” increased by 40% in the last 12 months whereas other team members haven’t changed their rate or, even worse, have been decreasing their rate. You can work with that to understand whether salesperson No. 1 is doing something the whole team can learn from. As always, our knowledge guy, James Campbell, has created a super guide for this whole process, which you can see below. We also have a nice and informative FAQ, which should answer most of your questions. You will note that we've gone ahead and switched your account to the new view, so you can get started immediately. We’re not done yet. We’re working on making it easier to compare individual team members to the whole team, add functionality that increases visibility into pipeline momentum (movement of open deals) and much more in the future. Watch this space.